Most soils will contain an ample supply of micronutrients for crop production. Plants also differ in their sensitivity to a micronutrient deficiency, which can affect the concentration of a micronutrient needed for adequate crop growth. Increased crop yield will lead to greater removal of micronutrients with harvest. Current research shows zinc, sometimes deficient in corn and edible bean production, is still a concern in some areas of Minnesota. Other elements such as boron, copper, or manganese will not increase grain yield. New collaborative research within Extension's North Central region focuses on micronutrients in soybeans. It shows that though we have seen changes to hybrids and varieties, increased yield and nutrient removal, micronutrients are not any more deficient now than they were in years past. What's the best application method? 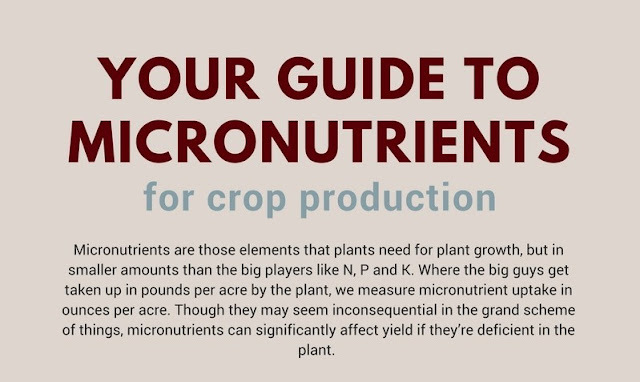 Since micronutrients are required in small quantities, broadcast application may lead to a poor distribution of nutrients in fields when using high analysis fertilizers. We've seen growers use foliar applications, but in that case we can't definitively say whether the plant leaves can take up nutrients. They may still have to travel through the roots. Banding a liquid fertilizer near the seed at planting may be a better option to allow for better access. But, be aware that applying fertilizer on the seed always presents a risk of seedling damage if applied at a high rate. Be sure to determine if an application is necessary before applying to avoid that risk for seedling damage. The best way to assess the need for micronutrients is with correlated soil test data. We see growers using plant analysis to identify nutrient deficiencies, but we recommend data that ties micronutrient concentrations to yield response. This will provide the most accurate information when choosing fertilizer applications.